So as I’ve said a bunch of other times, I really want to be more consistent with my blog-posting. I really, really do! And now that I’m out of school (ahhhhhhhh), I finally have the opportunity to. It’s on my post-grad-freedom to-do list along with planting a fire-escape herb garden and attempting to brew my own kombucha. Anyways, I love my food-hobbies and I’m tentatively trying to make a temporary-ish career out of my food snobbery, so I’m going to focus on those now, blog included. I have an irrational hatred for smoothie recipes. I’m sorry if this offends anyone (I told you, it’s irrational! ), but honestly COME ON, PEOPLE. Throw some things in a blender that sounds like they might taste good together and press start. That’s all you have to do. I find measuring out ingredients for something like this very silly. To me, smoothies are about experimentation and creativity. To approach making a smoothie with measuring spoons/cups and a strict “no funny business” mindset takes away all the fun! To each his own, I suppose. But it bothers me. It also makes it extremely hypocritical that I am here today to share a smoothie recipe. But allow me to explain. Okay so hear me out: even though I just aggressively expressed my distaste for smoothie recipes, I wanted to share this one with you. I’d prefer to call it a sort of “smoothie guide”, however; I refuse to actually list any actual measurements. It’s the combination of ingredients I want you to be aware of, not the proportions. That’s up to you! Blend! That’s it. 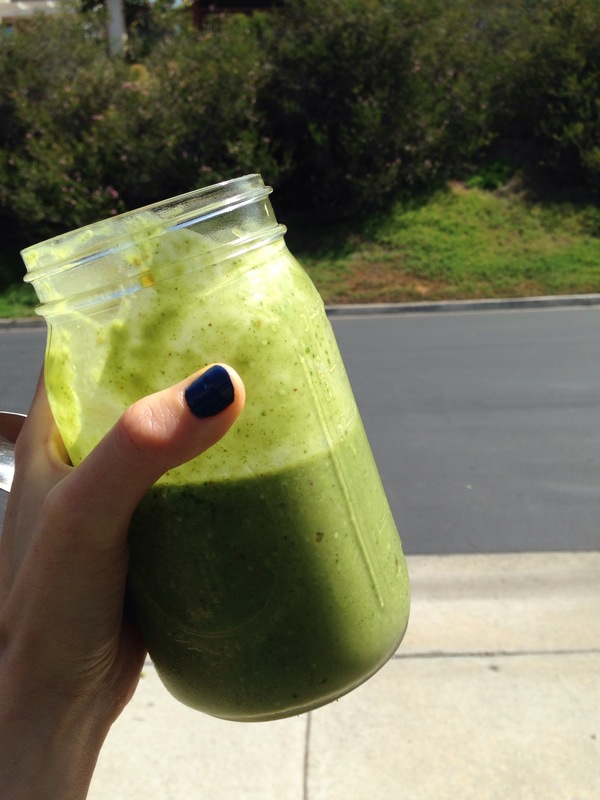 It’s super green and beautiful and tastes oh so delicious and creamy. Now go out and enjoy the sunshine! Categories: Uncategorized | Tags: breakfast, green smoothie, smoothie, snack, updates | Permalink.